Editors Note: There is a video and an image accompanying this press release. The confidence inspired by Canada's relatively strong economic performance following the 2008 economic crisis may be waning, as Canadians are less optimistic about their financial future than they were last year, and less optimistic than their counterparts globally, according to the second annual Global Investor Pulse Survey from BlackRock, Inc. (NYSE:BLK). The survey also showed that while Canadians recognize the importance of long-term financial goals, the high cost of living and competing financial pressures are making it hard for them to take action toward achieving those goals. While more than half of Canadian investors (52%) are feeling positive about their financial prospects, this represents a 3% decline from confidence levels in 2013, and is below the global average of 56%. The results are a reversal from last year, when Canadians were more financially optimistic than their global counterparts. As well, only one in seven Canadians (13%) see the economy getting better, compared with 22% globally. According to the global survey - the largest of its kind, covering 1,000 Canadian investors at a range of income levels, and 27,500 investors across 20 countries - the top priorities for Canadians are "saving money" (53%), followed by "saving for retirement" (42%) and "paying off debt" (41%). By a wide margin, the predominant financial risk respondents identified was the high cost of living in Canada: 68% said it was the biggest threat to their financial future, compared with just 46% for inflation and 45% for the state of the economy. The survey found that use of a financial advisor was directly correlated with the level of investor optimism. Nearly seven in 10 Canadian investors who use an advisor are optimistic about their financial future, compared with only 45% of those who do not get advice; currently only 29% of Canadians use a financial advisor. Other key differentiators on optimism included age (millennials were the most optimistic, at 62%; the 35-44 demographic was the least optimistic, at 47%) and gender, with 56% of men saying they are optimistic, compared with just 47% of women. Although six in 10 (61%) Canadians say that they take financial planning seriously this doesn't necessarily mean that they act when faced with their own life events. Four-fifths of respondents experienced some form of "life event" over the past 10 years, from buying a home or starting a family to getting a divorce or retiring. Yet relatively few respondents say they are taking concrete steps to financially prepare for those events. Of those who retired, only 19% sought professional financial advice, and one in three did nothing at all. While the average Canadian spends two hours a month reviewing their savings and investments, one in five (21%) respondents said that they spend no time at all doing so. Adding to this, fewer than half (45%) are maximizing contributions to their workplace pension plans, and nearly half (46%) do not know what the maximum contribution is. 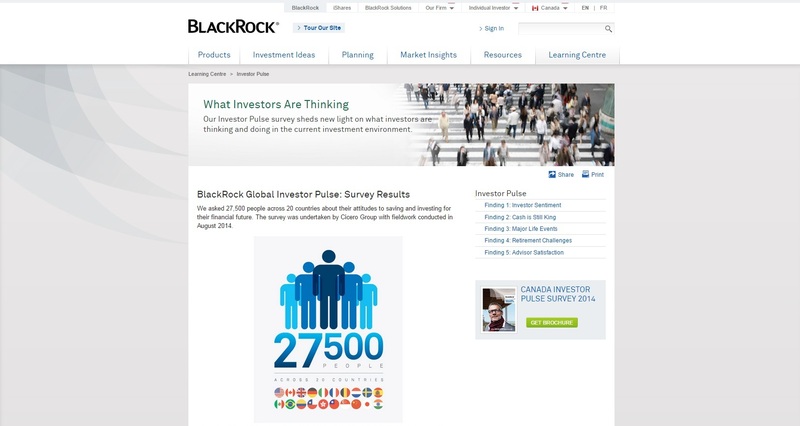 "While Canadians seem to place a high priority on long-term planning, their short-term actions could hinder making these goals a reality," said Noel Archard, Managing Director, Head of BlackRock Canada. "Concerns about debt and the cost of living, including housing, are high in Canada, and that seems to have put many in a situation where they are not taking advantage of some relatively simple things, like maximizing their workplace pension plans. Clearly, there's plenty of room for investor education and advice. More Canadians need to see that they do have options." The survey revealed that many Canadians feel that they are in a financial squeeze - hard pressed to save amid what they perceive as a high cost of living, including devoting much of their income to paying for their homes. On average, respondents said that they spend 43% of their income on housing costs (mortgage or rent plus utilities) - third globally to the Netherlands and Sweden - and have only 23% of income left over to save and invest - again, among the lowest rates in the world. As noted above, they are also very likely to say that the high cost of living is their biggest financial risk. And among the majority who do not use a financial advisor (71%), the main reason given is that they do not have enough money. Faced with financial uncertainty, Canadian investors seem to be holding larger amounts of non-income-generating cash than they think they should. On average, survey respondents said that they held 62% of their savings and investments in cash - higher than the global number of 59% - even though on average they say that ideally, only 27% of savings and investments should be held in cash. Those without an advisor say they have a far larger cash allocation (70%) than those with an advisor do (47%). "The seeming contradiction between how much cash people think they should hold compared to how much they actually do suggests that many Canadians know what they should do, but feel unable to act when it comes to their investments," says Archard. "Canadians realize that they are not adequately putting their money to work, but they don't know how or don't feel equipped to explore new options. The survey illustrates that sound financial guidance is, at least, a partial solution to this problem." Saving for retirement - or not? Nearly three-fifths of survey respondents (59%) say that they are currently saving for retirement, with relatively little variation across age groups, as 55% of 25-to-34-year-olds are saving, compared with 63% of 45-to-64-year-olds - who are approaching their retirement. Even though a majority of Canadian investors say they have begun saving for retirement, they are not necessarily confident that they are doing so effectively. In fact, only 30% of respondents say that they are well-prepared financially for retirement and 33% say that they will likely never be able to retire. Nearly half (48%) say they are concerned that they will outlive their savings in retirement, and half are concerned that future generations will not be able to save enough for a comfortable retirement. Again, the most commonly cited reasons for not saving are lack of disposable income (64%) and other spending priorities (32%). Given the relatively low savings' rate, Canadians' expectations of how much income they will need in retirement is ambitious. On average, respondents say they will need an annual retirement income of $69,700, while the youngest age-group (25-34) expects to need far more - $94,800 a year. But despite the savings gap, and despite the low actual rate of saving, Canadian investors are generally confident they can meet their income goals, with 60% saying they are very or somewhat confident they will attain their expected income in retirement. "Setting realistic goals is an important first step in financial planning, but our survey reveals that Canadians have conflicting attitudes and behaviours when it comes to retirement, and conflicting perceptions of how well prepared they are," says Archard. "Younger people in particular have less clarity about their after-work years." Although only a minority of respondents use a financial advisor (29%), virtually all of that segment (96%) are either very or somewhat satisfied with the service they receive. And a similarly high proportion - four in five - say that their advisors deliver excellent or good value for money. However, three in 10 (29%) Canadians who use an advisor admit that they have no idea how their advisor is paid for giving them advice, and 42% say they have only a general idea with no specifics. "The new regulations being introduced in Canada - around fee disclosure and reporting in the investment industry - will likely focus Canadian investors' attention more acutely around their relationship with their financial advisors," said Archard. "As the results show, Canadians are seeing clear benefits in using financial advisors and ultimately the value of advice, particularly in helping to prepare for their financial futures." One of the largest global surveys ever conducted, the BlackRock Global Investor Pulse survey interviewed 27,500 respondents, in 20 nations: the US and Canada; in Europe, Belgium, France, Germany, Italy, the Netherlands, Spain, Sweden, and the UK; In Latin America, Brazil, Chile, Colombia, and Mexico; in Asia, China, Hong Kong, India, Japan, Singapore and Taiwan. The Canada sample comprised 1,000 respondents. No income or asset qualifications were used in selecting the survey's participants, making the survey a truly representative sampling of each nation's entire population. Executed with the support of Cicero Group, an independent research company, the survey took place in August 2014. For the Canada sample of 1,000 respondents, the margin of error is +/- 3.1%. We asked 27,500 people across 20 countries about their attitudes to saving and investing for their financial future. The survey was undertaken by Cicero Group with fieldwork conducted in August 2014. Cash is King: Investors Find Comfort in Cash.